Born in Chicago in 1950, Jacie grew up in the then rural suburbs of the city. In 1971, she graduated with a B. A. in political science from the University of Denver. Disillusioned with the education system during the four years of her undergraduate work, Jacie had high hopes she would learn the answer to many of the burning questions in her heart by studying for an advanced degree. Jacie attended the University of Kansas for her Master’s in political science but, instead of being satisfied with the experience, she quickly became further disillusioned. At that point, Jacie left the formal education environment and began what she calls her, “20 years of independent study.” During this time, Jacie travelled the country alone. She worked in a factory, waitressed, served as a chambermaid, hotel manager, airline reservationist and grocery clerk. Eventually her travels led her to Idaho where she and her boyfriend, Rick, did self-sufficient farming on the dessert below Sun Valley. Way before their time, Jacie and her partner were both vegan and macrobiotic, all attempts to make sense out of life, to live in a non-harming respectful way and, in Jacie’s case, to find the true source of happiness which she knew instinctively did not lie in the external world. In 1975, Rick and Jacie attended their first Buddhist meditation course held outside of Santa Barbara, California taught by the most Venerable Geshe Lhundub Sopa Rinpoche. This was a life changing week for them both. Jacie was particularly doubtful and had to find out for herself if what she had learned was true for her personally. For the next year, Jacie tested each theory that had been presented plus she practiced the stabilizing meditation for 20 minutes every day for that full year. After this trial run, both Rick and Jacie were certain they had found what they had each been looking for so, in 1977, they attended the one-month long meditation course taught by Lama Thubten Yeshe and Kyabje Lama Thubten Zopa Rinpoche in Yucca Valley, California. After this course, they gave up their life in Idaho and moved to California to be part of the pioneers who developed Vajrapani Institute. In 1978, Jacie attended the first Deer Park summer program in Madison, Wisconsin. At this time, she was asked to join the tour party of Lama Yeshe and Lama Zopa to provide administrate support in Europe. After the European leg of the tour, Jacie accompanied Lama Yeshe to India. Shortly thereafter, she went to Kopan, (the lamas’ monastery in Nepal,) with Lama Zopa. Soon afterwards, Lama Yeshe asked Jacie to become the private secretary to the Lamas which Jacie did for the last six years of Lama Yeshe’s life. After Lama’s death, Jacie engaged in a one-year Vajrasattva retreat at Kopan. After that, at the request of Lama Zopa, she was appointed director of Tushita Mahayana Meditation Center in New Delhi, India. In 1986, Jacie returned to her family home in Boca Raton, Florida. On Christmas day of that year, she gave birth to her daughter, Felicity Noel. Three months later, she was asked to teach meditation at the Jewish Community Center in Boca. This led to her teaching at retirement communities, in private homes, to the employees of the Sun Sentinel and to various other groups including at Palm Beach State College. 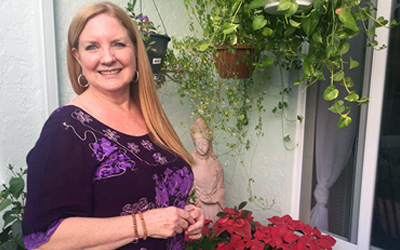 Jacie became dubbed, “The First Buddhist in Boca,” earning a reputation for conveying the Buddha’s teachings in a practical, warm, clear often humorous way making them useful in everyday Western life. This was the beginning of Tubten Kunga Center for Wisdom Culture.